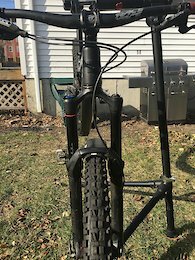 For sale is my 2018 Transition Sentinel Carbon Frame. 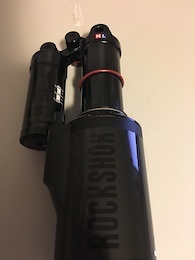 The frame will come with the headset installed and the DPX2 shock. 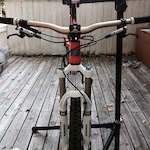 I bought the bike as a brand new complete X01 build on Oct 1st 2018. This frame only has 3 months of ride time on it. It is in very good shape and I like what it's all about. The wheelbase and reach are just a little much for me at my size. I am keeping the build kit and most likely swapping all the parts to a size small. As you can see in the photos, I wrapped the chainstays in 3M tape. The tape has rub marks from my 5.10's, not the frame. Other than that and a couple very normal scratches, the frame is flawless. Please let me know if I can provide anymore info and I am happy to take more photos. Really clean Alum 2014 5010. Awesome bike, only selling because I bought something new. No dents and almost zero scuffs. Built the bike up last winter and rode it for only this summer season. Really fun and simple bike with its current build. It is easy enough to find reviews etc... on the bike so I won't go into much detail. If you have any questions please ask. Fork---2014 Fox 34 CTD Shock---Fox Float CTD Brakes---Deore Bars---Sunline 745 Stem---Azonic 1x10 Drive Train Shifter---Zee Derailuer--- SLX Cassette--- SLX 10 spd Cranks---Gravity Chain Ring---Race Face narrow wide Sun Inferno 27 whilst w/ x9 hubs. Maxxis Ardent tires. For sale is my 2012 Status II. I bought the bike brand new mid summer in 2013. It has always been well kept and has many upgrades. 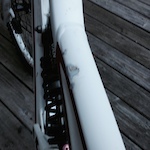 It has the cosmetic damage you would expect from a used DH bike. There is one dent on the top tube. This happened the first season I owned the bike and has caused no issue or concern for me. I would like to sell the bike locally but would ship at the buyer’s expense. I am happy to answer any questions, so please ask! Size M frame. Boxxer World Cup. Fox Van RC shock. Azonic Outlaw Wheel set. 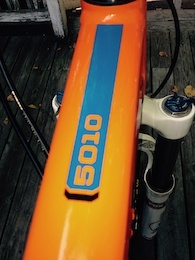 Chromag Fubar OSX 780 bars. Zee brakes. Zee shifter. Zee derailleur. Shimano 10spd cassette. Zee cranks. Gamut chain guide. Race Face Chain ring.